As leaders we all face tests, and we should welcome them. The greater our call to leadership, the greater the tests will be. Problems only provide the opportunity for us to grow and become more mature as leaders. Surviving the tests teaches us humility, because we have been tested and remained faithful. No matter if we are leaders in the workforce, in our homes, our communities, our church or in a variety of organizations, this book will help us stand when the task becomes difficult and demanding. 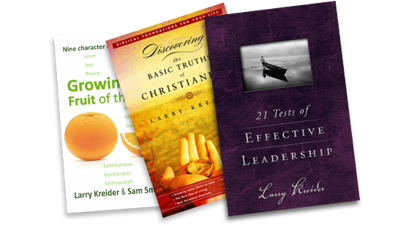 Allow the Lord to develop your attitude, character, gifts, and talents as you face the challenge of passing the “21 Tests of Effective Leadership” in your family, business, community, and church experiences. ?It is wonderful to be able to endorse this book on the 21 Tests of Effective Leadership. In a day where so many excuses are made for people who fail in qualification, we now have a trustworthy presentation of the standards we should establish for leaders. Bravo, Larry, for another important contribution.? ?Daniel Juster, Th. D, Director Tikkun International. Author of Due Process and other books. Larry Kreider is a leader of leaders, and one who has my utmost respect, trust, and friendship. I encourage every believer who desires to reach his or her maximum leadership potential to invest in this book, and glean from the seasoned insight of one the Body?s true Apostolic leaders.